Kenya bagged 15 points at the Gold Coast leg of IRB Sevens Series, the best start in the series so far. The team however, lost an extra 2 points after a 41-7 defeat to South Africa in a third place play-off on Sunday. Earlier on Sunday, Kenya beat hosts Australia 21-14 in a thrilling quarterfinal to advance to the main cup semis. However, the dream to get to the finals was dashed by the reigning series champions New Zealand who beat them 15-5 in the semis. 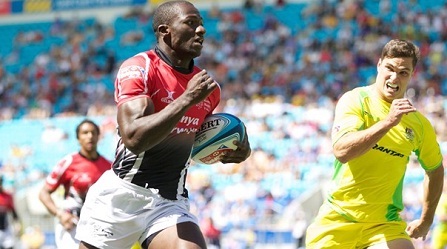 Spectacular Dennis Ombachi was named in the Gold Coast 7s dream team. The team is now preparing for the Dubai leg slated for November 30th to December 1st where they are drawn in Pool A with Spain, Scotland and Fiji. Fiji successfully defended the Gold Coast title by beating New Zealand 32-14 in the Cup Final.